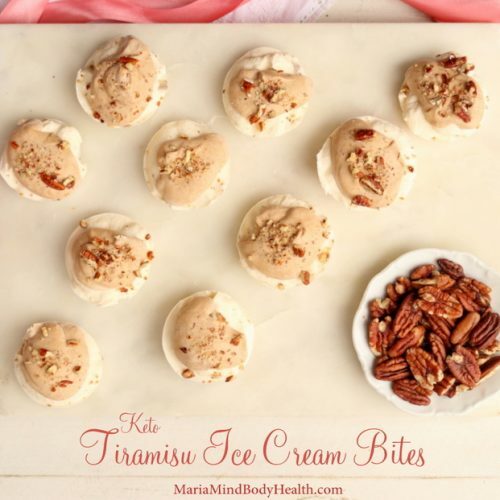 My keto butter pecan ice cream recipe is a total hit on my blog! The only complaint I get about it is that the ice cream is so delicious that many people overeat when they make it. I totally get it! I am a part of the “clean plate club” where you feel the need to eat the whole thing! That is why I practice portion control. 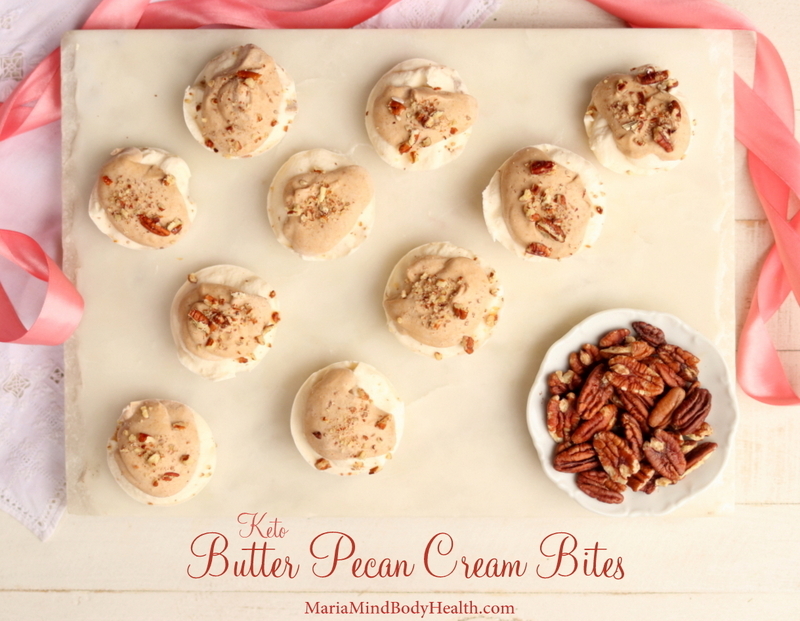 These Butter Pecan Ice Cream Bites are perfect for portion control! 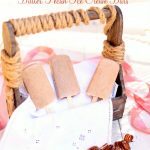 AND they are very easy to make on vacation! We are currently in Maui and we love to have a little dessert! Place the heavy cream in a chilled bowl and beat until stiff peaks form. Add in the softened cream cheese, natural sweetener and vanilla; combine until smooth. Place the mixture into a bendable chocolate mold (I used this muffin pan and placed it on a cookie sheet for stability). Place in freezer until frozen. 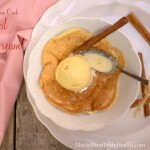 To make the Butter Pecan layer, Place the butter in a medium saucepan over high heat. Use a whisk to stir occasionally. Heat until butter starts to froth. Start to whisk often while brown flecks appear. Continue to heat and whisk until the butter turns a dark golden brown (not black). Place the brown butter and the rest of the ingredients into a blender and puree until well combined. Taste and adjust sweetness to your liking. Divide the mixture into each ice cream bottom. Garnish with additional pecans. “Hi, Maria! I’m so happy I met you! This is my first keto pregnancy after having 3 children and 1 miscarriage, and it is by faaaar the easiest. 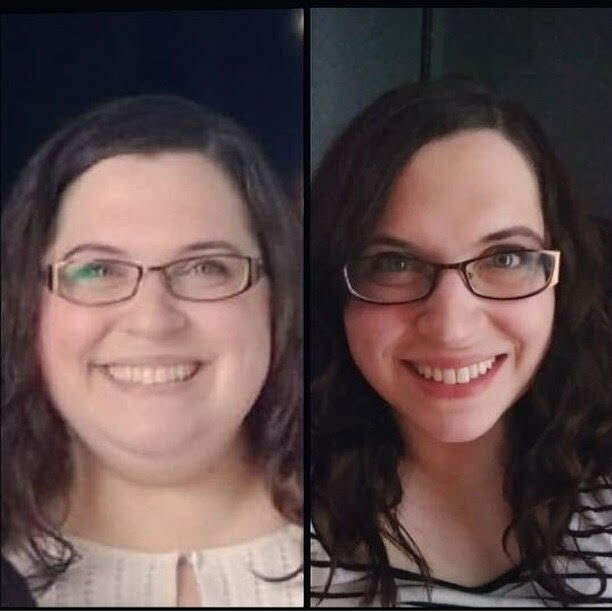 I started keto to manage my PCOS, but it’s not only enabled me to lose 90 lbs pre-pregnancy, but cured a fatty liver, normalized my A1C levels, cured my chronic hives, enabled me to get pregnant the very first month of trying (where it’s taken years for #2 and #3) and now virtually has eliminated my nausea throughout my entire pregnancy so far (whereas for my last pregnancy I was sick and on several meds the whole 9 months). I also do not have gestational diabetes this time around, where I have before. My increased energy is remarkable, and my other kids love your recipes so much, they often eat them up before I get much of them! Hi. This (& MANY of your recipes) sounds so good! I tried to hit the print button on the actual recipe but it comes up as a blank page. I have had this problem several times on your blog so figured you might wish to know about it. Anyway, thank you for all you do and I will be making these bites this weekend! Yum. Wish they were made from non dairy ice cream! Won’t eat dairy due to cruelty in the dairy factory farms. Especially because the mommas and baby calves are ripped apart so humans get the calves milk they need, and not them!😢🐮🐮Momma cows grieve terribly, babies are in terror! Actually, Maria, I’ve had a problem with ALL of your links. They just turn blue. And nothing happens. Sorry. I will take a look. Oh my! 2 hours is going to be a long time to wait for these to be ready. The two individual layers taste amazing separately, I really can’t wait to taste the finished product. Thanks for another amazing recipe! 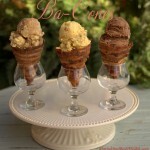 This looks so yummy, I’m going to make it today! Thanks for sharing so many wonderful recipes! Do you have a way to do your program without dairy and be successful? Thank you! Hi Maria – I’m fairly certain this is not something you want to hear ever but especially on vacation – there is definitely something going coocoo with your search bar. It truly is putting the letters in backwards… sorry. Thought you’d want to know! Thanks for this delicious recipe! Yes, the developers are looking at it. For now you can skinny up the browser window until the menu goes to the 3 lines. Then the search in that menu works.